It’s Spring – Let’s find flowers and bugs! The Caroline School is studying flowers and insects. We love hands-on learning, going on bug hunts, learning about life cycles, and watching things grow. I’m Emily Padora and I have been interning with Easter Seals Greater Houston for the past few months. I am supervised by Ashley Nichols, the Adult Program Director, which means I get the privilege of hanging out with these wonderful adults twice a week. Just last Saturday, I got to go bowling with a few of them! I expected it to be fun, as most things are with these guys, but it was more than just fun— it was heartwarming. Each participant got their own lane, with accommodations based off their individual needs, to bowl for as long as their hearts desired until it was time to go. I loved seeing how happy just a simple game of bowling made the participants and enjoyed watching them make strikes, splits, or just celebrating hitting a pin. It was truly something else. I also got to speak with the mother and sister of two of our participants; they were sharing with me how much they appreciate what Easter Seals and the Adult Program has done for them and their family. The mother was almost in tears, expressing to me that most people outside of this organization and program don’t pay much attention to her boys. It makes me happy and proud to be working with an organization and program that promotes growth and encourages inclusion and individuality. For the past seven years, Entergy Texas customer Melissa Delgado of Conroe has participated in Entergy’s Super Tax Day events to get her taxes done for free. It is one of many events held as part of the Volunteer Income Tax Assistance (VITA) program – a program sponsored in part by Entergy. At roughly $300 per year, Delgado has saved more than $2,100 – money she would have had to pay to a tax preparation company. That savings, along with what she gets back on her taxes through the Earned Income Tax Credit, really adds up for her family. Delgado and her family plan to use their tax refund to pay for health insurance. Meanwhile, a young woman named Ashley returned to get her taxes done for a second year – a year after tax volunteer Carmen Phillips with Easter Seals Houston‘s Housing and Financial Literacy Program gave her a packet of financial education materials that taught her how to create a budget and track her expenses. “After last year’s event we spoke a couple times via phone, but I did not hear from her again until she walked up to my table,” explained Phillips, who works for Easter Seals of Greater Houston. “She immediately recognized me and told us that because of that packet and our discussions in 2017, she worked hard all year sticking to her budget worksheets and tracking her spending – so much so that she was able to purchase her first home! Since 2011, Entergy has been sponsoring VITA sites in all five of its operating companies – Entergy Texas, Entergy Louisiana, Entergy New Orleans, Entergy Arkansas and Entergy Mississippi. Of more than 111,125 tax returns filed, customers have gotten back near $200 million in refunds. In Texas alone, more than 8,200 tax returns have been filed, with customers getting back more than $11.5 million in refunds. 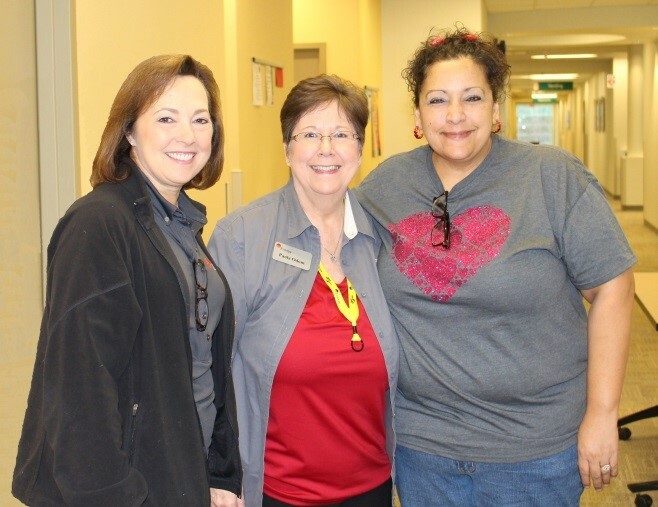 Pictured above: Entergy Texas President and CEO Sallie Rainer (left) visits with Senior Customer Service Specialist Paula Odom of Entergy Texas Public Affairs and Entergy customer Melissa Delgado.